MALVACEAE. Attractive tender shrubs grown for their beautiful flowers and handsome foliage. Good in the greenhouse or outdoors in California and the South. Best in loose well-drained soil. Treat like geraniums or fuchsias, they make nice pot plants. 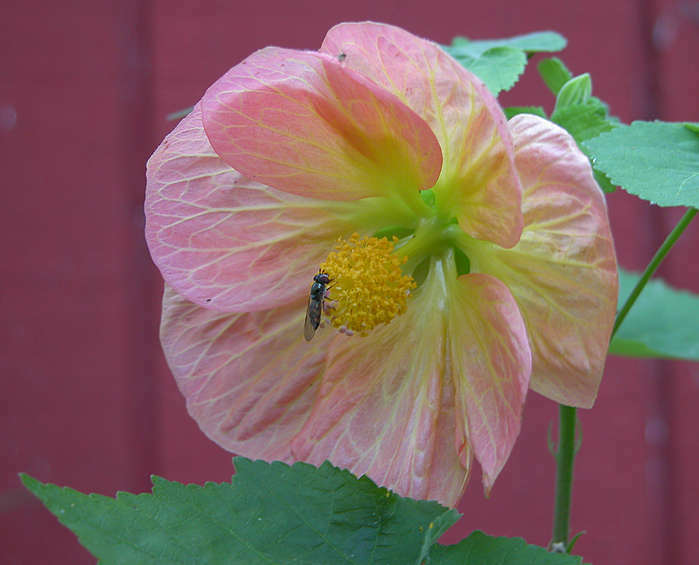 'FLOWERING MAPLE'. Nodding bell-shaped 2 - 3" flowers in pastels shades of orange, red, white, and pink. Arching shrub to 10 feet, with broad maple-like leaves. Main bloom period in spring, but some colors are almost everblooming. Makes a nice tub plant in the North, and can be pinched to keep compact. Zone 8. Easy from seed, germinates in 1 - 2 weeks. Large blue and white mallow-like 2 - 3 1/2" wide flowers. Half hardy shrub or small tree to 1 1/2 - 3 feet in cultivation, to 25 feet in the wild. Lobed 6" leaves. Coastal Chile. Said to be hardy to Zone 7. Good in the cool greenhouse. Choice. Germinates in 2 - 4 weeks. LEGUMINOSAE. Some 1200 warm-region species of great ecological and evolutionary interest. Their earliest fossils are in North America, from where they expanded to worldwide, with an Australian center of diversity. Many species remain to be discovered. Some of the endangered endemics are now common in cultivation and are naturalized in safe new habitats. Highly ornamental, drought resistant, and should be grown by everyone living in warm climates. Excellent in pots in the cool greenhouse or on a sunny windowsill. They produce timber, fuelwood, dyes, tannins, medicinals, gums, forage, food, perfume, are nitrogen-fixing, soil stabilizing, diversifying, and have been used by man since the Neolithic. Elegant puff-like flowers and either feathery pinnate foliage or the leaves reduced to flat phyllodes. Fast growing, free blooming and ranging from tiny shrubs to tall trees. Best in areas with 18°F minimum temperature, though some stand some snow. Full sun and well-drained soil. Plant out early. Most have very long lived seed. Nick and soak to germinate in 1 - 4 weeks, unless noted otherwise. Zone 9 unless noted otherwise. Smoke treatment may help germination. For pushing the hardiness limits, try: boormannii, dealbata, melanoxylon, penninervis and pravissima. Other fairly hardy species: baileyana, decurrens, farnesiana, longifolia, and angustissima. 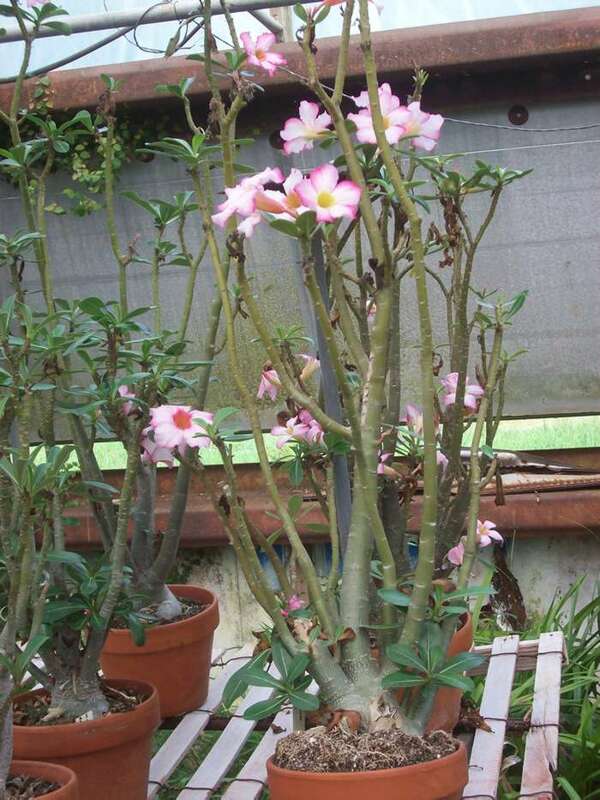 For growing in pots, try: baileyana, brachybotrya, burkitti, Drummondii, farnesiana, glaucoptera, granitica, Greggii, lineata, macradenia, longissima, complanata, mucronata, obtusifolia, Sophorae, suaveolens, triptera, uncinata, and victoriae. For species closely related to the ever-popular but currently unavailable alpina and phlebophylla, why not try: floribunda, longifolia, longissima, mucronata, obtusifolia, Sophorae, and triptera. 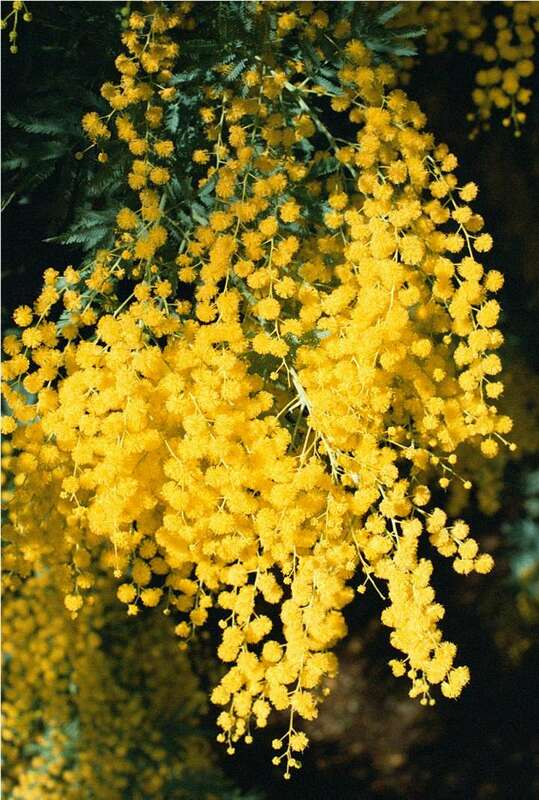 'GOLD-DUST WATTLE'. Abundant bright golden yellow flower balls in spring. Rounded shrub to 8 feet, with inch-long phyllodes. SE Australia. Zone 8. Nick seed to germinate in 6 - 12 weeks. 'GUM ARABIC TREE', 'BABUL'. Sweetly fragrant bright yellow flower balls and feathery bipinnate leaves. Thorny rounded tree to 30 feet or so. Africa to India. Zone 9. Stands severe drought and flooding, saline soil, good for land reclamation. Excellent firewood, used for tools, and the leaves and pods are nutritious fodder. Bark used for tanning and medicine, and is a source of gum arabic. 'EARPOD WATTLE'. Fast growing tree to 95 feet. Spikes of yellow flowers followed by twisted pods. Flat 8" leaves. New Guinea. Excellent for tropical reforestation, it can grow 19 feet in 2 years, and reach 55 feet in 8 years. Builds soil, fixes nitrogen, smothers imperata grass. Stands soils ranging from pH 3.0 to 9.0, and rainfall from arid to 8 feet per year. Produces up to 20 cubic meters of fuelwood per year. Stands both clay and sandy soils. 'COOTAMUNDRA WATTLE', 'GOLDEN MIMOSA'. Spectacular masses of fragrant golden flowers in January and February, almost covering the tree. Feathery blue-grey bipinnate foliage on a small compact tree with arching growth, to 30 feet. One of the hardiest, Zone 8, and tolerates most any soil and full sun to part shade. Native to only a few stands in New South Wales, Australia, and would be endangered if not in cultivation, a fine example of garden preservation. Nick seed. 'PURPLE-LEAVED COOTAMUNDRA WATTLE'. Young foliage tinged purple. Prized. Nick seed. 'LONG-POD WATTLE'. Showy shrub to 3 - 9 feet, with abundant yellow flower balls in summer to autumn. Broad green 2 - 3" leaves and long straight 6" pods. E. Australia. Excellent in warm coastal areas and should be grown more. Rarely seen in cultivation, and much sought by collectors. Nick seed. Germinates in 1 - 6 weeks. 'BLUE BUSH'. Narrow blue-green foliage on a shrub or tree to 5 - 25 feet. Rare endemic with bright yellow flower-balls and 3" pods. Bendethera, NSW Australia. Zone 8. Soak, nick hard, to germinate in 2 - 4 weeks. 'SILVER WATTLE'. Profuse bloomer forming a mass of bright yellow fragrant flowers in late winter. Elegant silvery green feathery foliage. Fast growing adaptable tree to 50 - 100 feet. SE Australia. Zone 8. One of the hardiest, standing considerable snow and low temperatures. Grown for perfumery, fuelwood, tannin, gum production and florist material. Nick seed. 'DRUMMOND'S WATTLE'. Golden flowers in inch-long spikes on a nice dwarf shrub to 3 - 6 feet. Dark green feathery bipinnate foliage. West Australia. Excellent pot plant in the greenhouse. "One of the most beautiful little shrubs imaginable."—H.E. Saier. Nick seed. 'FLATWATTLE'. A remarkable shrub with long, saw-edged, leaf-like phyllodes with the flowers arising from the center vein. Young growth is reddish. Australia. An unusual, attractive species, unlike all others in its bizarre form. Nick seed to germinate in 2 - 4 weeks. 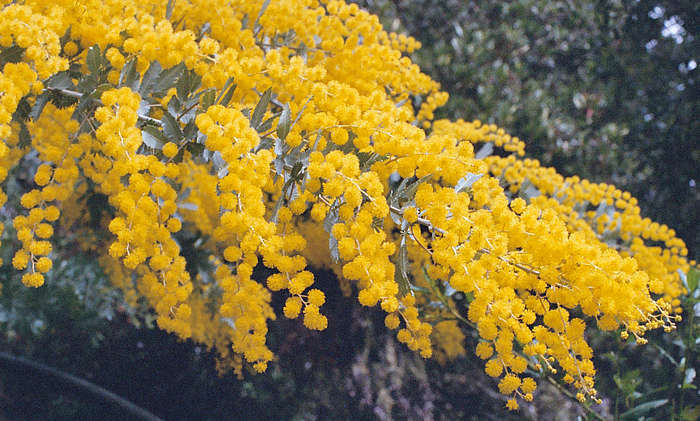 'SYDNEY GOLDEN WATTLE'. Scented yellow flowers in 2" spikes produced abundantly in spring. Rounded, fast-growing tree or shrub to 20 feet, with bright green 3 - 6" leaves. E. Australia. Good hedge, windbreak, stands salt spray and clayey or sandy soil. The pods were roasted and eaten by the aborigines. Closely related to A. Maidenii. Nick seed. 'ZIG-ZAG WATTLE', 'MYALL'. Beautiful weeping shrub with zigzag branches that change direction at each phyllode. Clustered bright yellow balls of flowers. Australia. Produces beautiful, hard blackish wood which takes a high polish. Excellent unusual specimen shrub for warm regions, reaching 30 to 50 feet in good areas. Nick seed to germinate in 1 - 2 weeks. 'MAIDEN'S WATTLE'. Rare and beautiful upright shrub with pale yellow spikes of flowers. Narrow 3 - 8" leaves, coiled and twisted 5" pods. E. Australia. Blooms late summer to late autumn. Fast growing, becoming a dense-crowned small tree to 50 feet. Good landscape material for warm regions. Nick seed to germinate in 1 - 2 weeks warm. 'BLACKWOOD ACACIA', 'MOOEYANG' (aboriginal name). Creamy flowers in March and April. Tall evergreen tree to 40 to 120 feet, with 2 - 4" phyllodes. SE Australia. Hardy to 15°, fast growing. Good shade or street tree in California. Valuable timber tree. The hard, dark wood takes a fine polish and is used for furniture, veneers, and by the aborigines for war shields. Bark yields tannin and was used by the aborigines to stupefy fish. Nick, 1 - 2 weeks. 'NARROW-LEAF WATTLE'. Deep to pale yellow flowers in spikes in early summer. Shrub or small tree to 6 - 30 feet, with narrow 2 - 10" leaves. N.S.W. and Tasmania. Variable. Good in cool to cold areas, Zone 8. Related to A. Maidenii. Nick and soak seed to germinate in 1 - 3 weeks. 'PROSTRATE ACACIA'. Sweet-scented grey-green foliage and yellow flower-balls in spring. Prostrate shrubby ground cover to 1 - 2 feet, and spreading to 15 feet wide. W. Australia. Good cover for banks. Zone 8. Nick seed to germinate. 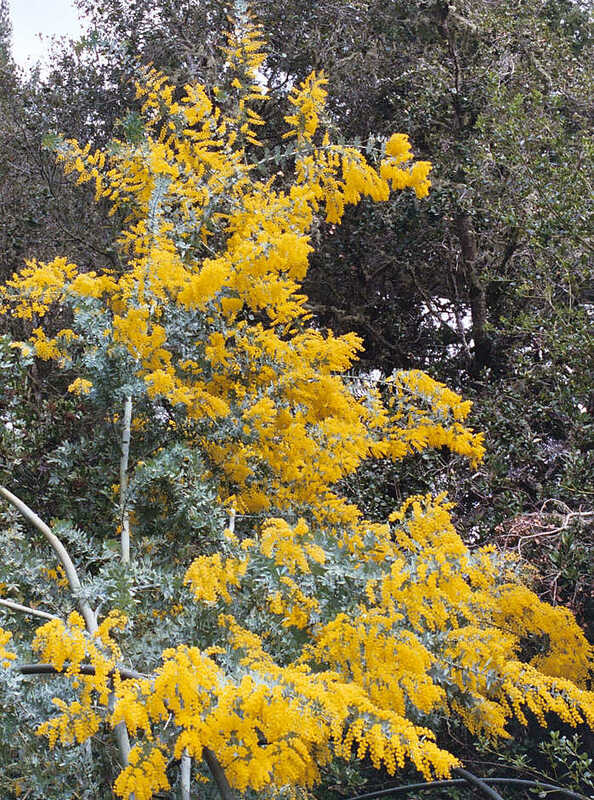 —Acacia simplicifolia: See Reserved Access Page. 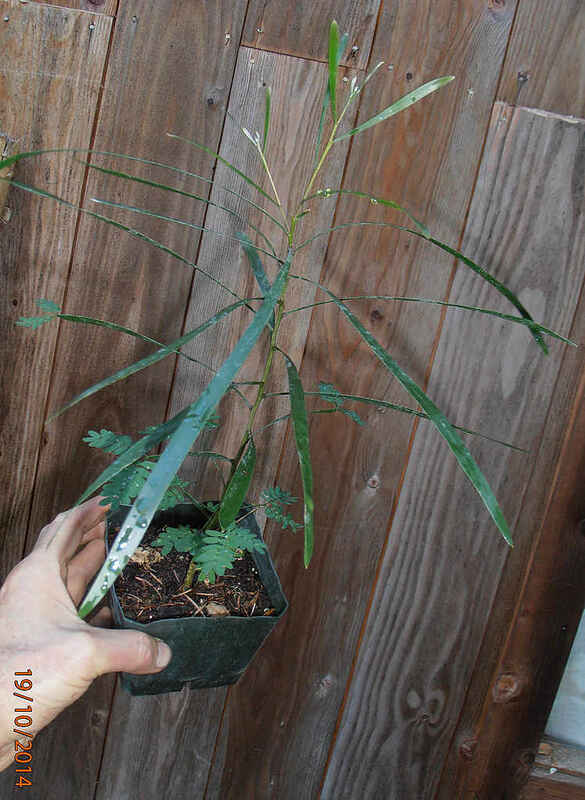 —Acacia simplex: See Reserved Access Page. Lemon-yellow flower balls on a strongly aromatic shrub to 6 feet, with narrow phyllodes. Endemic to a tiny area. Nick to germinate in 2 - 4 weeks. 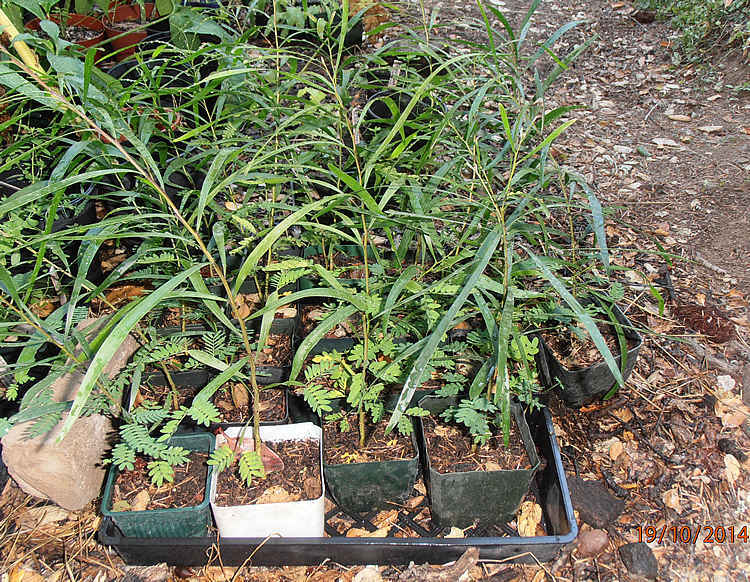 'RIVER COOBA', 'EUMONG', 'SHOESTRING ACACIA'. Long thin phyllodes to 16", on a fast-growing weeping small tree to 20 - 30 feet. Creamy 1/2" flower balls in winter and spring. Eastern Australia. Stands wet streamside conditions as well as drought. Hardy to Zone 8. Soak, nick hard, to germinate in 2 - 6 weeks. 'SPURWING WATTLE'. Dense shrub to 6 feet, with odd pointed leaves resembling three wings spreading out from the stem. Dense spikes of yellow flowers in spring. E. Australia. Unusual and distinctive. Zone 9. Related to A. Maidenii. Nick, germinates in 1 - 2 weeks. COMPOSITAE. North temperate region perennials grown for their attractive flowers and often aromatic foliage. Easy in any soil and full sun, good in borders and rock gardens. Good for fresh or dried cut flowers, and if started early will bloom the first season. Hardy and easily grown favorites Some can be mown for a lawn substitute. Most kinds hardy to Zone 2 or 3. Germinates in 1 - 2 weeks warm. Bright golden-yellow flowers in dense 2 - 3" clusters in June to August. Hardy perennial to 20" or so, with silvery-grey foliage. S.E. Europe. Zone 4. 'YARROW', MILFOIL', 'THOUSAND SEAL', 'KWAYU'HAYIPSNL' (Chehalis Indian name meaning "squirrel-tail"). White 1/4" flowers in flat 2 - 6" clusters in June to September. Aromatic hardy perennial to 2 - 3 feet, with delicate feathery 8" leaves. North Hemisphere. Easily grown old-fashioned flower, giving lots of bloom for little care. Forms nice clumps with age. Good for sowing in meadows. Highly valued as medicine in all parts of the world where it grows, used for coughs, colds, aches and pains, to stop bleeding, childbirth medicine, bronchitis, and as a tonic. Girls would put it under their pillows to dream of future lovers. Was used as a tobacco substitute, for snuff, and in place of hops for brewing beer to make it more intoxicating. Contrary to popular belief, this is a native North American plant. Germinates in 1 - 2 weeks warm. Striking strain with flowers in shades of red, pink, apricot, yellow, pale yellow, beige, and an occasional white, May to October. Hardy perennial to 2 feet, with feathery leaves. Superior strain! Germinates in 1 - 2 weeks. 'ROSY RED YARROW'. Nice deep reddish-pink flowers in flat 2 - 6" clusters in June to September. Hardy perennial to 1 - 2 feet, with delicate feathery leaves. North Hemisphere. An old-fashioned carefree favorite, good for naturalizing in meadows. Germinates in 1 - 2 weeks warm. Dwarf alpine to 2 - 6" tall. Small white flowers in dense clusters, and strongly aromatic, feathery grey woolly leaves. Alps. Zone 4. Medicinal. Germinates in 1 - 3 weeks. "Man is the dream of a shadow. "—Pindar, 500 BC. LABIATAE. Eurasian aromatic herbs, good in dry rocky soils. Often classed as Calamintha. 'ALPINE BASIL THYME'. Violet 1/2 - 3/4" flowers with white markings on the lip, in loose whorls, June to August. Hardy perennial to 10 - 18", with small leaves. Mountains of Europe and N. Africa. Zone 4. Good in full sun, dry rocky soil. Used for flavoring and tea. Germinates in 1 - 4 weeks with light or GA-3. RANUNCULACEAE. Hardy herbaceous perennials and annuals valued for their showy summer to fall bloom. Though they stand full sun, they are at their best in part shade and cool, moist fertile soil in the back of the border. Divide roots in early spring or fall. Good for naturalizing in woodlands. Most are poisonous. Generally Zone 3 unless noted otherwise. Seed germinates best at cold temperatures—keep at 40°F for 3 months or more. Easy on damp paper towels in the refrigerator. Large violet-blue 1 1/2" flowers in long panicles in mid to late summer. Vigorous hardy perennial to 5 - 6 feet, with dark green 3 - 5 lobed leaves. Central China. Zone 3. Germinates in 10 - 20 weeks at 40°F. 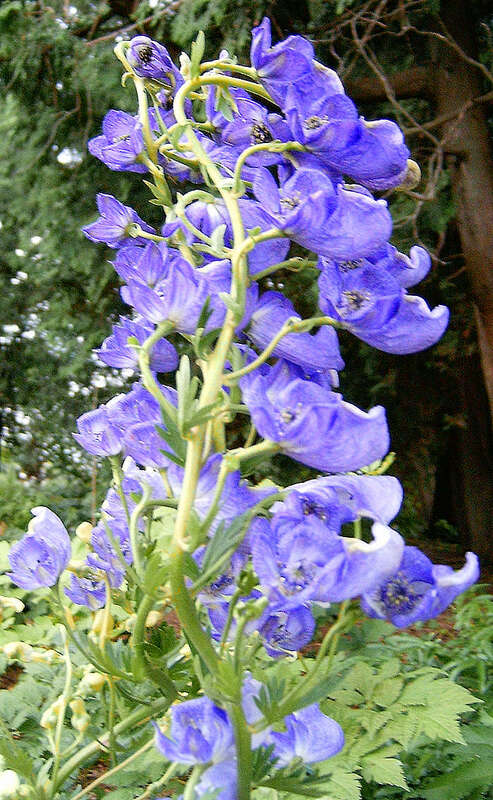 'TRUE MONKSHOOD'. Intense dark purple-blue helmet-shaped 1 1/2" flowers in dense 8" racemes in July and August. Hardy perennial to about 3 feet, with palmately divided leaves. Europe and N. America. The extremely poisonous roots were used as an arrow poison and medicinally. Germinates in 2 - 6 months cold. Pale yellow 3/4" flowers in open clusters. Hardy perennial to 3 feet, with large rounded basal leaves. Central Europe. Zone 3. Best with 2 weeks warm, then move to cold to germinate in 1 - 5 months at cold. BOMBACEAE. Tropical trees and shrubs with large pendulous flowers. They make nice foliage plants when young. Good in the greenhouse or outdoors in the far South. Likes sandy, clayey soil. Rest dry in winter. Hardy to at least 27°F. Easy from seed. Nick and soak till swollen, to germinate in 1 - 7 weeks at warm temperatures. Avoid high humidity. 'BAOBAB', 'LEMONADE' or 'MONKEYBREAD TREE'. The famous African tree with a huge swollen trunk up to 30 feet in diameter, and not more than 60 feet tall. The thickest trunk in the world. Large, white, hibiscus-like 6" flowers are pollinated by bats. The foot-long, gourd-like fruits are filled with refreshing, lemon-flavored pulp and edible seeds. Leaves are eaten like spinach. The trunk stores considerable water, and is used as a reservoir, sometimes being tapped for as much as 1000 gallons. Hollowed out, they are used as rooms. Worshipped as a fertility tree. Nick and soak to germinate in 1 - 7 weeks. APOCYNACEAE. Succulent shrubs resembling miniature baobabs. Sow in light, well-drained mix and keep warm. Give light shade when young, and use fungicide if rot or damping off is a problem. 'DESERT ROSE', 'MDAGU'. Thick swollen caudex/trunk to 3 - 15 feet, with thick, gnarled branches with 6" leaves clustered at the tips. Large red, pink, or white 2" flowers. South Africa to Arabia. Zone 10. The sap is used as an arrow poison. Germinates in 1 - 3 weeks. Avoid sogginess and rot. CAMPANULACEAE. Hardy Eurasian perennials like Campanula, and as easily grown. Best in light well drained soil. Most germinate in 3 - 6 weeks at cool to warm temperatures. 'LADYBELLS'. Sweet-scented light blue 1/2" wide bell-shaped nodding flowers borne profusely in summer. Very hardy perennial to 1 1/2 - 3 feet, with round, heart-shaped basal leaves. Eurasia. Zone 2. Cultivated in Japan for the thick, edible roots. Germinates in 2 weeks. 'ALLEGHANY VINE'. Clusters of purplish-pink to white 1/2" Dicentra-like flowers in July to September. Clambering biennial vine to 16 feet or more, with fern-like blue-green foliage. Cool shady places, E. U.S. and perhaps Korea. Zone 5. Give 6 - 8 weeks warm, then 6 - 8 weeks cold, and hold pots for 2 years if there is no germination. LABIATAE. Delightful aromatic perennials from Asia and North America, with spikes of flowers much like Salvia. Easily grown. 'ORANGE HUMMINGBIRD MINT'. Bright orange tubular flowers in spikes, late summer. Aromatic silvery grey foliage. Shrubby to 30". S. U.S., México. Zone 7. Attracts hummingbirds. Germinates in 1 - 2 weeks. 'ANISE HYSSOP', 'WONDER HONEY PLANT'. Lavender-blue flowers in large spikes from early June till frost. Hardy perennial to 3 - 4 feet with strongly anise scented leaves. N. Central U.S. The leaves are used fresh or dry as a tea or seasoning, especially by the Indians. The flowers produce abundant nectar and it is an excellent honey plant. Birds like the seed. Blooms the first year. Germinates best with GA-3. Year-old seed germinates in 1 - 3 weeks. 'MEXICAN HYSSOP'. Brilliant reddish-purple inch-long flowers in spikes, July to October. Perennial to 2 - 4 feet, with lemon-scented foliage. México. Zone 7. Blooms the first year. Young leaves used in salads or as tea. Germinates in 1 - 2 weeks. 'SUNSET HYSSOP', 'LICORICE MINT'. Orange inch-long flowers with lavender calyces, in summer. Very sweetly aromatic foliage—grey-green narrow leaves with a feathery effect. Perennial to 2 - 3 feet. SW U.S. to México. Good in hot dry areas. Said to stand to Zone 5 if well-drained. The deliciously-scented foliage is used as a tea. Germinates in 1 - 3 weeks. 'GIANT HYSSOP'. Violet to rose 1/2" flowers in 2 - 6" spikes. Hardy perennial to 6 feet. W U.S. Zone 4. Used for tea and the seeds were eaten. Germinates in 1 - 2 weeks. AGAVACEAE or LILIACEAE. 'CENTURY PLANT'. Striking, mostly arid-region plants with dramatic rosettes of sword-shaped, succulent leaves. They range from tiny rosettes less than a foot wide, to gigantic species 20 feet wide, sending flower-spikes 40 feet into the air. Various species provide food - roasted hearts, leaves and nectar; fiber - henequen, sisal, and paper; drink - fermented juice for pulque and distilled for mescal. They provide thorns for needles, thatching, smoking and other uses. 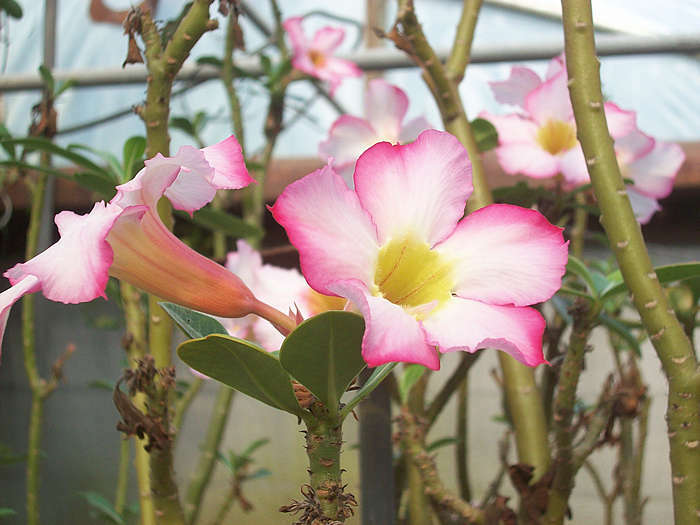 Easily grown outdoors in mild climates or in pots in the North. Set outdoors in summer. Best in a well-drained sandy loam and full sun. Sow on the surface to germinate in a few weeks to 3 months or so. Rosettes of sword-shaped, grey-green 16" leaves, spine-edged and tipped. Yellow 1 - 2" flowers on 6 - 10 foot spikes. California to México. The hearts were baked by the Indians for a sweet food. Zone 9. Germinates in 1 - 2 weeks warm. MYRTACEAE. 'WILLOW MYRTLE'. Handsome, drought-resistant West Australian trees. Fast growing and noted for tolerating severe arid conditions if given a few deep waterings while establishing. Smoke treatment may help germination. 'PEPPERMINT WILLOW MYRTLE'. Striking weeping tree to 25 - 35 feet, densely clothed with narrow, willow-like, bronze-edged 6" leaves, which are a rich pink in spring. Abundant, scented small white flowers in spring. W. Australia. The foliage is strongly peppermint-scented when crushed. Quickly forms a nice single-trunked tree resembling a weeping willow. Tolerant of a variety of soils, good in limestone areas. Easy in tubs, sun or semi-shade. Freezes to the ground at 25°F, but can stump sprout. "One of the best small trees for California gardens where temperatures stay above 27°F."—Sunset. Germinates in 2 - 28 weeks at warm temperatures. ROSACEAE. 'AGRIMONY' Hardy perennial herbs with racemes of small yellow flowers. Grown for ornament and the fragrant medicinal leaves, which are a popular spring tea. Good in the shade. 'AGRIMONY'. Golden-yellow apricot-scented flowers in dense, slender spikes. Deep green pinnate aromatic foliage. Hardy perennial to 3 - 5 feet. Europe. Zone 3. The fragrant leaves are used as a tea, and it produces a yellow dye. Prechill seed 8 weeks to germinate in 1 - 10 weeks at cool temperatures. 'CORN COCKLE'. Large magenta-red to purple 2" wide flowers with darker veins, carried on graceful, willowy stems. Showy and easily grown hardy annual to 2 - 3 feet, with narrow, greyish 4 - 5" leaves. Europe. The flowers have a striking, downy, five-pointed calyx. Germinates in 1 - 2 weeks. LABIATAE. 'BUGLE-WEED'. Easily grown hardy herbaceous annuals and perennials with abundant, usually blue tubular flowers in spikes in summer. Low growing plants, the perennials creeping. Useful in the border, wild garden, and as groundcovers. 'BLUE BUGLE'. Bright blue 1/2 - 3/4" flowers in leafy spikes in May and June. Creeping hardy perennial to 4 - 16", with oblong leaves. Sunny dry areas, Europe and Asia. Zone 4. Nice ground cover. Give GA-3 to germinate in 1 - 3 weeks.